The 2016 Toyota Prius went through a major makeover in comparison to the Prius’ look and feel for the 2015 model year. Both inside and out, the 2016 Prius looks sleeker and includes significantly more tech features than last year’s model. In recognition of the improvements and advancements to this year’s model, the 2016 Prius was the number one pick as Best Hybrid and Electric Cars category by Edmunds. A few reasons for this are because the Prius has the best gas mileage on a car without a plug. By driving a vehicle like the Prius, that has an excellent hybrid fuel economy of 58 MPG city and 53 MPG when on the highway and low emissions, drivers help keep the environment clean, even while driving. The Prius is available in six different trims, all of which have the same hybrid engine. The 2016 Prius engine is a 1.8L 4-Cylinder engine that produces 121 horsepower. The Prius is run on both electric and gas. During start-up and low speeds, the Prius is powered only by the electric motor, which works off of a battery. As the battery charge dies, the gasoline engine responds by powering the electric generator, recharging the battery. In addition to having a hybrid engine, the Prius also has a very modern energy efficient system called regenerative braking. 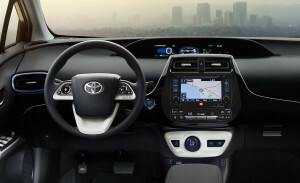 Basically, when a driver brakes, the Prius has a computer system within it that configures a generator that is able to convert the energy required for braking to also charge the battery. 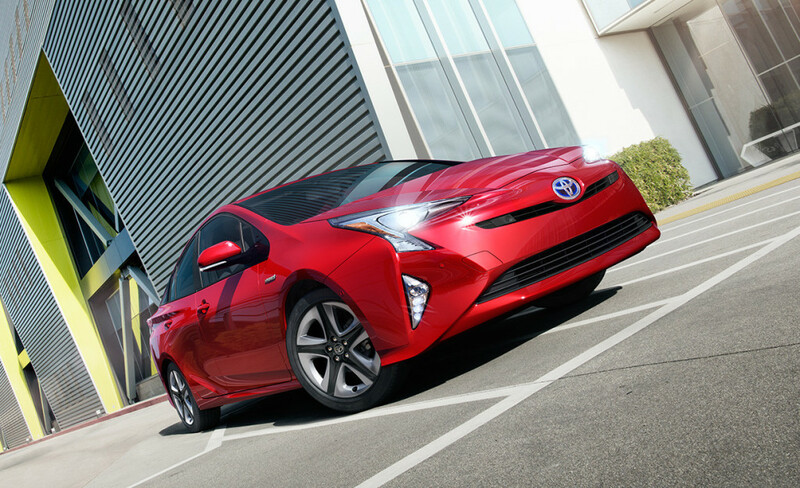 The major difference between the Prius’ six trims are the technology and convenience features included on each one. The Two is the very basic model, as the trim increases in price so does the technology. Each trim beyond Two have updated navigation, smart key, and SiriusXM Satellite Radio features. The Prius Four Touring is the most equipped trim, and this trim includes a variety of tech features on the interior as well as updated exterior features like LED headlights. Some of the new interior features on the 2016 Prius include a wireless smart phone charger located in the center console, a smart flow climate control, a 4.2-inch digital information display, push-button start, a backup camera and a option for a moon roof. According to car critics the 2016 Prius model has the highest quality interior yet for the car.The interior uses high quality materials and attractive styling. The Prius also offers, more cargo space than most other hybrids because of the hatchback style. Both the front and back seats of the Prius have been reviewed as very comfortable. Not to mention, the back seats surprisingly have enough space for someone around six feet tall to sit comfortably in. The 4-door sedan has a slanted hatchback feel. The objective for the 2016 Prius was to make this hybrid vehicle better looking than other hybrids on the roads and to improve its look over past Prius model years. The Prius is a 4-door vehicle that has a modern hatchback design. To keep the Prius as fuel efficient as possible, the Prius was designed with sleek lower and wider shape that improves the car’s aerodynamics. Buyers have the option of five different color options ranging from white to bright red. Some of the extra style options available to buyers include LED headlights and taillights, and optional 17-inch wheels that add a sportier feel to the car’s exterior. The 2016 Prius has a whopping five star safety rating, and ranks five stars in nearly all crash testing rating by the IIHS. Some important safety features in the Prius include stability and traction control, emergency braking assist, front, rear, and side airbags, and daytime running lights. Pricing for the 2016 Prius starts at $24,00. Warranties include: a 3-year or 36,000-mile basic warranty and a 5-year or 60,000-mile powertrain warranty.